Ready for some happy news among all the gloom surrounding government shutdowns, border security, and malfeasance in high places? Here’s something that may put a smile on your face. According to researchers in Western Australia, eggshells may be the key to abundant, inexpensive energy storage. Dr Manickam Minakshi and his colleagues began experimenting with eggshells in 2017 using eggs purchased at the local supermarket. “Eggshells have a high level of calcium carbonate, which can act as a form of replenishing energy,” he tells the Canberra Times. “What’s interesting is that the egg membrane around the yolk allowed us to cook it at a high temperature, crush it into powder and bake it at 500 degrees Celsius with the chemical still present.The final baking process changes the chemical composition from calcium carbonate to calcium oxide and allows it to become a conduit for electricity. For Dr Minakshi’s team, this represents a first step towards work on an alternative battery to store energy from renewable energies such as solar panels and wind turbines. “Renewable energy resources are intermittent as they depend on the weather,” he says. “When we have an excess, we need a battery to store it. 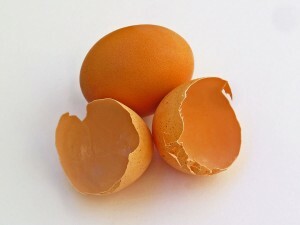 Ground egg shells serve as the electrode to store this.” Before being heated, the eggshell is a positive electrode but when heated it changes to be a negative electrode, he explains. Dr Minakshi says he hopes his research will attract the attention of renewable energy companies. Assuming further tests prove the validity of his preliminary results, abundant and affordable materials like eggshells have the potential to provide energy storage from items that would otherwise be little more than bio-waste. The research in the laboratory will continue to determine how much electricity the eggshell powder can store and for how long. Minakshi even has plans to test free range eggshells to see if they have better conductive properties, although why that would be is not clear. Perhaps free range chickens have higher levels of self esteem which lead to chemical changes in their eggs.